[S353] Beaconhills Country Golf Club, Beaconhills Minute Books. [S22] Victorian Government. BDM Index Victoria (online) "#D24404/1980 - Place of birth Noradjuha." [S22] Victorian Government. BDM Index Victoria (online) "#D16622/1982 - Place of birth Rutherglen." [S22] Victorian Government. BDM Index Victoria (online) "#D14553/1982 - Place of birth St Arnaud." Ken started work at Bradford Cotton Mills as a textile engineer and soon after joined his father's industrial power transmission business, Donald Don & Sons. 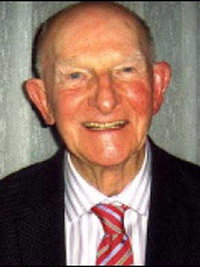 Ken was appointed Managing Director in 1960 and retired in 1985. Ken furthered his distinguished schoolboy athletic career by winning sprint titles at Victorian and Australian championships over several years. In 1948 he ran 9.6 seconds over the 100 yards, a remarkable time that was only 0.2 seconds outside the then-world record. His athletic career was cut short by a severe leg injury just before the 1948 London Olympics when he was in contention for Australian Olympic selection. Ken still holds three school sprinting records for the under 15 100 and 200 metres (1940) and under 16 200 metres (1941). For many years Ken was a welcome visitor to the Scotch Main Oval where he coached numerous schoolboy sprinters. Ken was an active supporter of the Old Scotch Athletics Club and generously hosted many end-of-season award gala nights at his home in East Ivanhoe. He enjoyed golf and was a talented A grade squash player, playing weekly up until the age of 70. Over a 35-year period Ken was a track judge at the Associated Public School Athletics Championships, and in 2003 was recognised by the APS for his many years of outstanding service. [S80] Ancestry - Family Tree, graeme semken. [S22] Victorian Government. BDM Index Victoria (online) "#D10646/1960 - Place of birth FITZROY NORTH." [S353] Beaconhills Country Golf Club, Beaconhills Minute Books, Minutes 20 Oct 1947. [S22] Victorian Government. BDM Index Victoria (online) "#D6652/1983 - Place of birth Bendigo." [S22] Victorian Government. BDM Index Victoria (online) "#D5973/1957 - Place of birth BALLARAT." [S22] Victorian Government. BDM Index Victoria (online) "#D5280/1981 - Place of Birth Morwell." [S22] Victorian Government. BDM Index Victoria (online) "#D19610/1965 - Place of Birth Scotland." [S353] Beaconhills Country Golf Club, Beaconhills Minute Books, Committee Meeting 8 Mar 1948. [S65] Ancestry - various indices, Who’s Who in Australia, 1921-1950. Member(s) of Household: Margaret Cowing, Elizabeth Cowing, Sarah Cowing, Marguerite Cowing. [S332] UK - General Register Office Indexes.